Systems administrators know how to troubleshoot technical issues, but resume solutions can be elusive. See this sample for resume upgrade ideas. To be a successful candidate for tech jobs, resume expert Kim Isaacs says it helps to have a comprehensive resume. Systems administrators know how to troubleshoot technical issues, but resume solutions can be elusive. 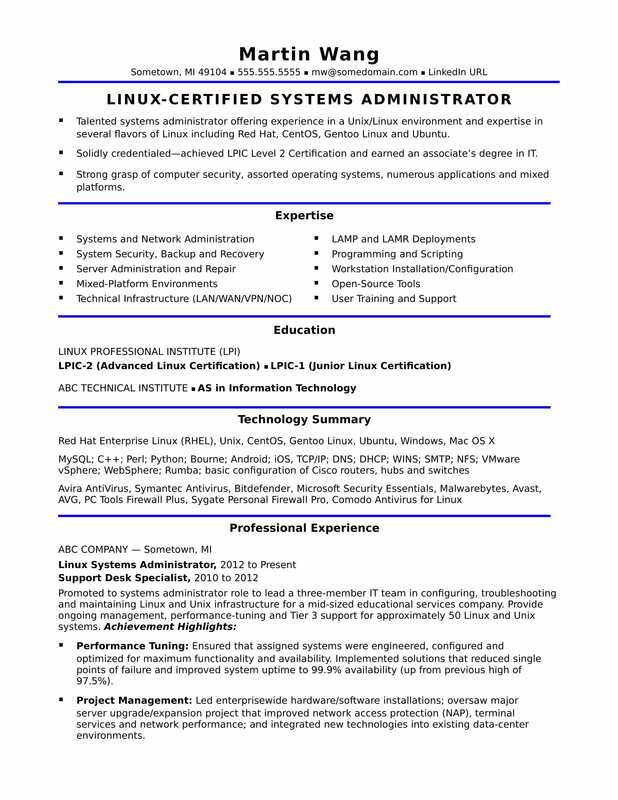 To get ideas for upgrading your own resume, view this sample resume that Isaacs created below, or download the midlevel systems administrator resume template in Word. And if you need more help, get a free resume evaluation today from the experts at Monster's Resume Writing Service. Talented systems administrator offering four years of experience in a Unix/Linux environment and expertise in several flavors of Linux including Red Hat, CentOS, Gentoo Linux and Ubuntu. Solidly credentialed — achieved LPIC Level 2 Certification and earned an associate’s degree in IT. Strong grasp of computer security, assorted operating systems, numerous applications and mixed platforms. Performance Tuning: Ensured that assigned systems were engineered, configured and optimized for maximum functionality and availability. Implemented solutions that reduced single points of failure and improved system uptime to 99.9% availability (up from previous high of 97.5%). Project Management: Led enterprisewide hardware/software installations; oversaw major server upgrade/expansion project that improved network access protection (NAP), terminal services and network performance; and integrated new technologies into existing data-center environments. Security: Strengthened system/network security and business-continuity planning as a member of company’s security incident response team. Troubleshooting: Rectified many issues by instituting best practices in system log analysis, backups, network operating center security, user account/permissions management and systems/software auditing.